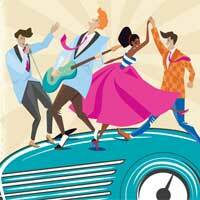 "...Doo Wop harmonies reign supreme out Long Beach way as International Theatre takes audiences on a tuneful trip down memory lane in Life Could Be A Dream, two delightful hours of late-1950s/early '60s nostalgia from Roger Bean." "...There are moments of genuine emotion as well. Mr. Shor and Ms. Matthews deliver a soul-satisfying rendition of "Unchained Melody" that frankly turned me into a puddle. As we got up for intermission, I discovered that I was far from alone as others nearby fluttered handkerchiefs and daubed their eyes. The release of emotion prompted by performance is one of the great gifts of theatre and, of course, the Greeks had a word for it-catharsis."